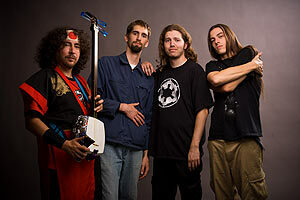 God of Shamisen is a band from California, led by a master of the Shamisen, a fretless Japanese lute. The band involves elements spanning a multitude of genres, including progressive rock, metal, and funk. Major news! Our shamisen master Kevin Kmetz plays a bunch of the instrument for the new movie Kubo and the Two Strings! Watch the trailer below, and get tickets to the movie here. Read more about the movie, and Kevin's involvement, here! Buy our latest album download here! You can also get first album, the limited edition 7", and exclusive T-shirts in our website store. First album also available on Amazon and iTunes. 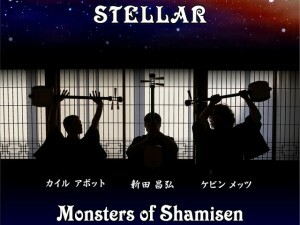 June 23, 2013 — Kickstarter: Monsters of Shamisen CD! 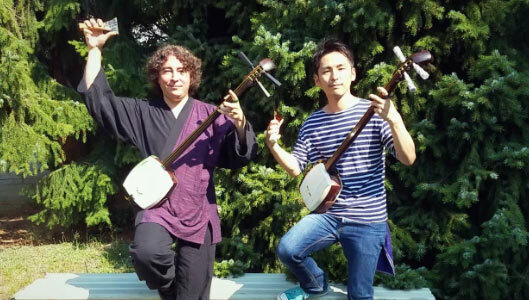 But in the meantime, our good friend and shamisen player Kyle Abbott is trying to fund the new Monsters of Shamisen album, which feature’s GOS’s very own shamisen master Kevin Kmetz! Check out the KIckstarter campaign right here! And as of this writing, the campaign has almost expired!! (It may be over by the time you read this.) But if you can, check it out and please help their project! October 7, 2012 — “Begin Japanology” interview with Kevin! Kevin Kmetz, with some live footage of God of Shamisen, was featured in a recent episode of Begin Japanology, a Japanese documentary TV show. Check out his interview in this video! Please donate to the Japanese Red Cross Society, or other foundations, to help Japan! 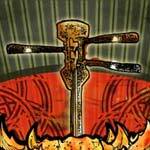 November 23, 2010 — Buy our second album: SMOKE MONSTER ATTACK! Smoke Monster Attack is now available for purchase! You can listen to previews and buy MP3 from CDBaby here. Or you can buy MP3 or high quality lossless FLAC from LobeFood here. Check out our new album and let us know what you think! We are also proud to announce that our first album, Dragon String Attack, is also finally now available in lossless FLAC format as well. 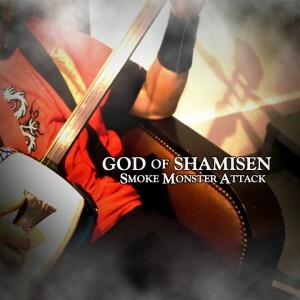 Teaming up with producer Billy Anderson, God of Shamisen returns with Smoke Monster Attack, their second album. 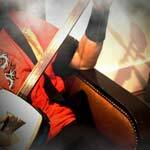 Featuring some new tunes along with some interesting video game cover songs, we run the musical gamut from an aggressive new arrangement of the traditional “Jongara Bushi,” to the Indian-inspired mellow breakdowns of “Last Shamisen Master Attack,” to a wild metal cover of the Star Wars theme. The album will be only available digitally, and will be available to download on iTunes, Amazon, and other online stores soon! More details soon. October 29, 2010 — Thank you, Kansas City! Earlier this month, God of Shamisen played at the 2010 Greater Kansas City Japan Festival. Here’s some video from our weekend! If you want to know more about more upcoming shows, tours, and announcements, please join our email list! Emails are infrequent and you may remove yourself whenever you want.